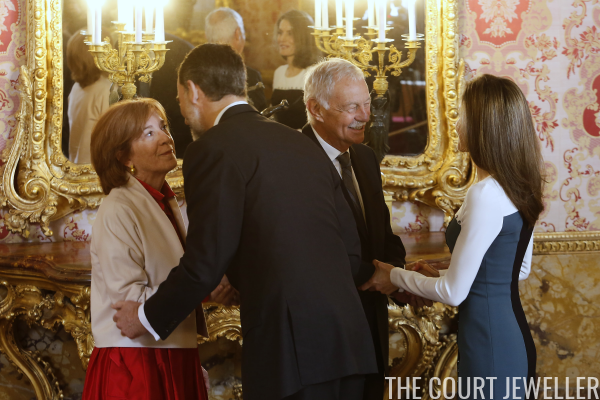 On Wednesday, King Felipe and Queen Letizia of Spain hosted an official luncheon for the 2016 Miguel de Cervantes Prize, honoring novelist Eduardo Mendoza Garriga. For the occasion, Letizia kept her jewelry classic and simple, wearing a pair of round pearl stud earrings. Here's a closer look at her earrings for the day. And another look at her entire ensemble. I think the earrings were an elegant choice, but I also think the dress could have handled a bolder accessory. What do you think, magpies?